Welcome to our charming renovated condo and a fabulous vacation that is yours for the making. 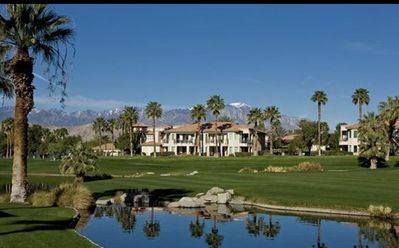 Come relax and enjoy the beautiful weather and surroundings of this premier golfing destination community in La Quinta, California. 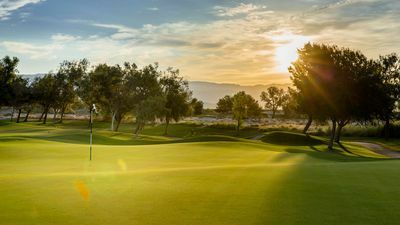 Our unit has spectacular southern mountain and 10th fairway/green views of the La Quinta Resort's famous Mountain Course. 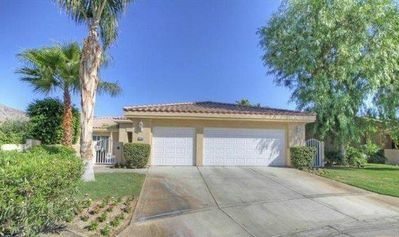 This is a 3 bedroom, 3.5 bath home with a guest casita. Enter the custom wood gates to a lush, landscaped, private courtyard with a lovely eating/sitting area. Comfortable new club chairs surround a gas fire pit table for lingering conversations. Through the glass front doors you will enjoy the wonderful open floor plan with high ceilings in the living and dining areas and custom furniture that is both comfortable and chic. The porcelain tile floors, plush oriental carpets, warm paint colors, custom window coverings, and gas fireplace make this space even more inviting. 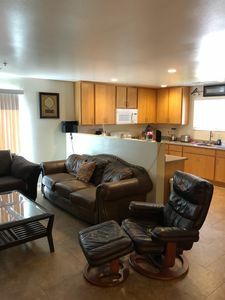 There is a large flat screen in the living room as well as DVD player and stereo amp which allows for your personal music device connections. 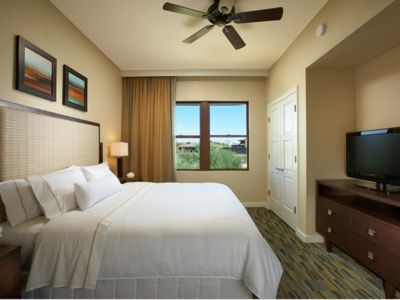 Premium cable and 5G high-speed wireless internet complete the amenities. The kitchen has been completely renovated (Aug. 2017) along with new appliances (Dacor gas cooktop), cookware and service pieces; meeting a demanding cooks needs. The kichen's cheerful breakfast area seats four at the table and two on counter stools. The 'formal' dining room area comfortably seats six. It's French doors frame mountain views and lead to an outdoor dining and BBQ grilling area. Just off the foyer is a powder room for guests' convenience. The master bedroom has a new, premium king bed, walk-in closet. Adjoining the master bedroom is a renovated (Aug. 2017) master bath which features granite countertops, double sinks, large soaking tub and a separate shower area. The 2nd bedroom has twin beds, large mirrored closet, and an adjoining dressing area and bath. As an option, the twin beds beds may be converted into a King bed, along with proper linens. The configuration option is yours. In addition to the home's interior hallway, the second bedroom may also be accessed through the room's French doors which access the private courtyard. Adjacent to both of these bedrooms is a full service laundry room. The third bedroom is a separate and private guest casita which is located off the courtyard. 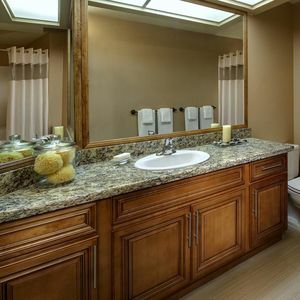 This private get-away features a King bed with an adjoining dressing area featuring a granite vanity/sink....a separate room features the shower/bath and toilet. Also featured is a large closet and 42” flat screen TV. The three bedrooms are all recently carpeted and very private. Open the french doors in the light-filled living room to a lovely patio complete with new barbeque and spectacular views of the mountains and sunset in the early evening. However the morning's rosey pink sunrises painted upon the mountains are equally as beautiful. There is a wonderful feeling of privacy and warmth in this tranquil space where one can enjoy a good book or glass of wine at the end of the day. The flow of the home from the private courtyard to the indoor areas and the back patio is conducive to entertaining. The well equipped wet bar, with refrigerator, in the foyer area enhances the entertainment flow. 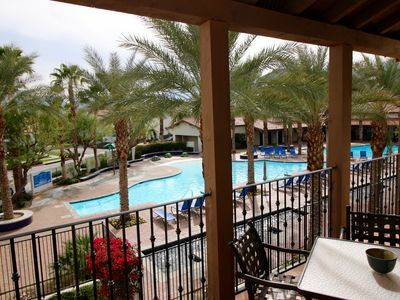 Bring friends and family and enjoy the lovely amenities our home has to offer. 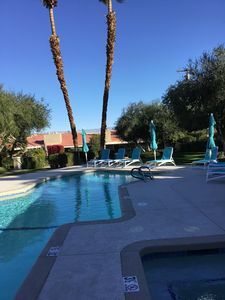 The pool and spa are located right across the street and we are a short walk to the Golf Club for the Mountain and Dunes courses at the resort as well as to the Waldorf Astoria’s La Quinta Resort and Spa. 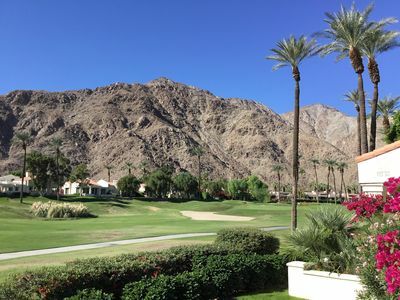 This hotel has the most gorgeous landscaping in the desert. The flowers, fruit trees, and large open spaces are timeless and so inviting. The Resort's highly regarded restaurants, outdoor lounges, shopping and entertainment is just a quick stroll away. 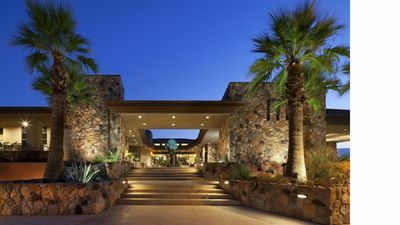 Our family truly savors our desert hideaway, a gem we hope you too will enjoy. 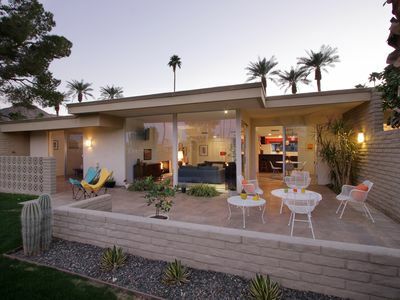 This is a beautiful desert oasis designed for your comfort and pleasure. Please be our guests! 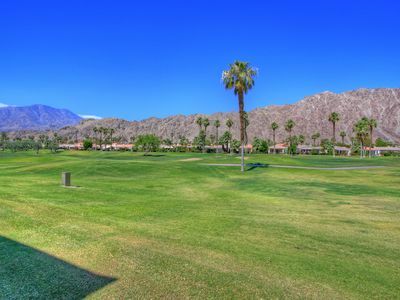 Lakefront La Quinta Home w/ Golf & Mtn. Views! 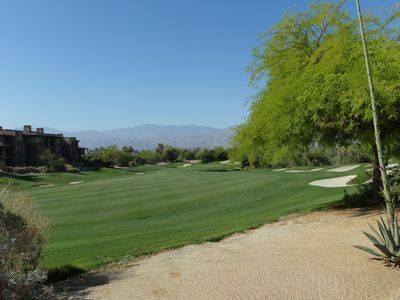 Beautiful Marriot Shadow Ridge resort in Palm Desert available in June !